Taylor Momsen: You may know her as her former character, "Jenny", on Gossip Girl or from her rock band, The Pretty Reckless. Either way, you best bet this 22 year old has got some serious style. Keep reading to see how you can steal Taylor Momsen's goth rock style to embrace your alternative edge. Do you ever see a girl walking on the street and just think, "She's so cool"? Well, Taylor Momsen IS that cool girl. Luckily, it's super easy to get her look by wearing a simple pair of black jeans, a tee, and a black leather jacket. Depending on where you're headed or what your agenda is for the day, you can keep this outfit casual by wearing sneakers or flats, or dress it up with wedge sandals or heels. Add a rocker edge with layered chokers and spiked necklaces, and (OF COURSE) do not forget your go- to pair of sunglasses to be extra intimidating to any possible cat- callers. 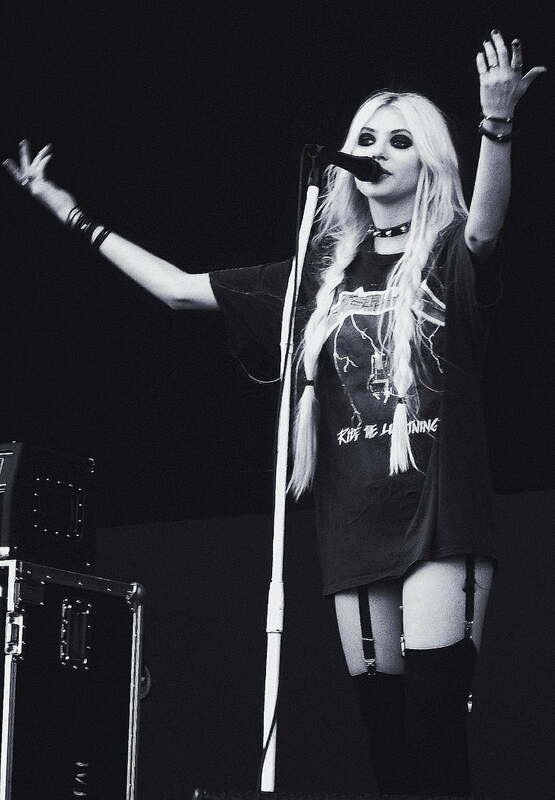 When she's performing with The Pretty Reckless, Taylor keeps a comfy style fused with a gothic flair by wearing an oversized graphic t-shirt and patterned lace leggings. While this style is a bit revealing for an everyday ensemble, you can make it school- acceptable by switching out the tee for a t-shirt dress. Finish this look with a pair of combat boots, stacked rings, and Taylor's signature smoky eye makeup. For the days when you're headed to a business meeting, a day at the office, or going to your internship, it's important to make a positive, professional impression... but that doesn't mean you can't incorporate your alternative style into your career look! Keep it classy with a pair of leggings underneath a leather A-line skirt, a mock neck sweater with studded details, and a structured jacket. Show your youthful side with a pop of color in your shoe choice. Try a tall pair of heels, or if you're on the move, take it easy on your feet by wearing flats. Okay, okay, we know what you're thinking. "Where could I possibly wear that?" Girllll, don't doubt us. While we don't recommend wearing a corset dress to the workplace, a corset top is an awesome piece that can be easily incorporated into an outfit by pairing it with ripped jeans or a gothic skirt. If wearing a corset is a bit too bold for your liking, you can get a more modest look by wearing a bodysuit instead. Top your outfit with a utility jacket for a dressed down, grunge style or go rocker chic in a leather jacket. Or, you know, just flaunt it like Taylor and wear your corset bodysuit all on its own. You've probably been anxiously anticipating if there are any more looks that involve a cozy t-shirt, and the answer is yes. If you want to amp up the simplicity of a loose tee, pair it with leather pants and go all out on accessories. We're talking layered necklaces, stacked bracelets, and as many skull rings that you can pack onto one hand while still being able to move your fingers. This outfit is formal enough for a night out with friends, and casual enough for a day at school. Do you like Taylor Momsen's style? Which outfit will you rock next? Share your thoughts in the comments below!